This model is the AHI 8/261 Cowboy Riders Set in various colours. The first rider is dressed in brown hat, yellow neckerchief, red shirt, black belt, light tan trousers and black boots and sits astride a brown horse with blue saddle blanket. The horse's reins and bridle are painted black, as is the cowboy's lasso and the reins in his left hand. The base stand is green. The second rider is dressed in brown hat, red neckerchief, blue shirt, black belt, light tan trousers and brown boots and sits astride a white horse with brown saddle blanket. The horse's reins and bridle are painted brown, as is the cowboy's lasso and the reins in his left hand. The base stand is green. The third rider is dressed in brown hat, red neckerchief, blue shirt, black belt, light tan trousers and brown boots and sits astride a black horse with grey saddle blanket. The horse's reins and bridle are painted brown, as is the cowboy's lasso and the reins in his left right hand. The base stand is green. The base stands and figures have no manufacturer's mark but do carry a country of origin detail (JAPAN). 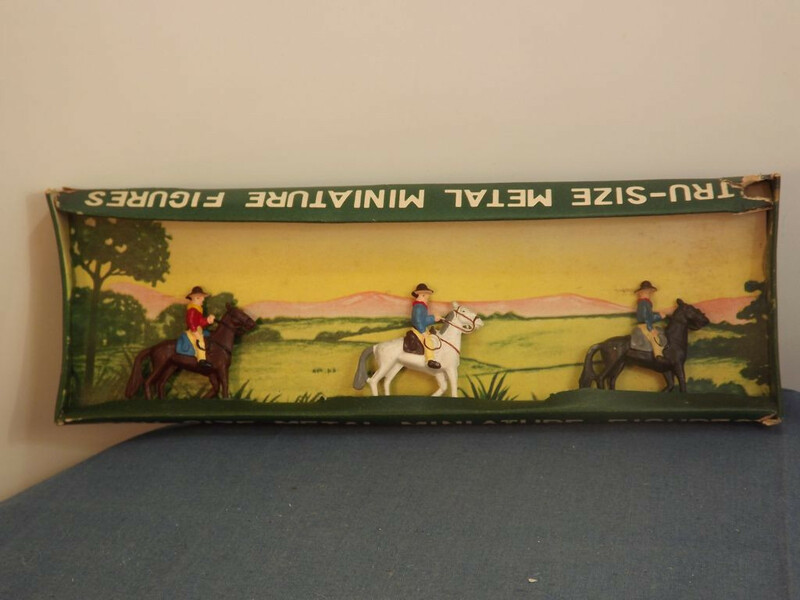 The item comes in the distinctive green cardboard packaging associated with this brand of toys and the flat tray has no cellophane wrapped around it. The green card carries a white panel on each end and the left hand end has "8/261" in blue text on it. The front and rear sides have "Tru-size Metal Miniature Figures" in large white lettering centred in the middle of the side and "Japan" in smaller text below this to one side. The bottom of the tray is green.